“It’s lovely. I like the fog,” said Kate Soto, as she gazed out the eastward-facing window of the Logan Center. Soto, the coordinator of the Committee on Creative Writing, had good reason to be content, regardless of the outside conditions. 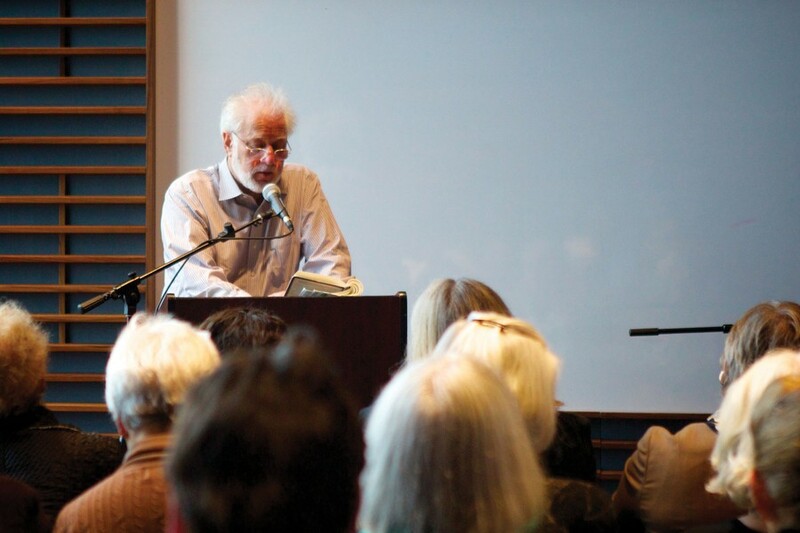 The audience for Kestnbaum Writer-in-Residence Michael Ondaatje, who spoke Monday afternoon in Logan Center, had already filled the Performance Penthouse to capacity. Just before the event got underway, attendees were asked to move to the center of their rows to make room for latecomers, prompting a dull roar as musical chairs-like shuffling rippled through the crowded space. Ondaatje chose to first read several poems from Handwriting, one of his 13 collections of poetry. Though he is most widely celebrated for his fiction, Ondaatje has serious poetic chops, and put them on full display at the event. In “The Great Tree,” a poem about a Chinese calligrapher’s brush strokes, “language attacks the paper from the air.” “Step,” which conjured a “full moon in a forest monastery,” was deeply evocative. Amidst his elegant metaphors, Ondaatje’s poems were also personally revealing. In “The Great Tree,” he addresses the calligrapher, “So I have always held you in my heart,” and in “Step,” he mentions “a lazy lunch, then sleeping together, then the disarray of grief.” In the conversation with literary critic Donna Seaman that followed, Ondaatje spoke about trying to pare his poetry down to the fewest possible words. “How do your poetry and prose work together?” Seaman asked. Ondaatje’s prose was just as enchanting as his poetry, though more concretely descriptive. In one passage, the young protagonist, Michael, sees a girl go into an outdoor shower fully clothed after roller skating. “We began to get up earlier to watch her roller skate…She was like some kind of clothed animal. This was a new kind of beauty.” Other knockouts included Michael’s description of people who came before him (“innocent knights in a dangerous time”), his account of riding out a storm (“It was as if we were staked out in sacrifice”), and his thoughts upon encountering shady merchants in the Suez Canal (“We thought that our lives could be large with interesting strangers, who could pass by with no involvement”). Seaman was full of praise for Ondaatje. “You put together collages of sensuousness and history,” she told him.